Amika Mobile Corporation today announced that it has again received Lenel® certification to satisfy Lenel's OpenAccess Alliance Program (OAAP). Amika Mobile's AMS for critical and emergency alerts integrates with the OnGuard® access control system, enabling alerts to be sent automatically based on physical systems events. This can trigger alerts with relevant text, image, and audio content based on security or life safety events, reaching mobile devices, desktops, displays, pagers, phones, strobes, etc. by group membership and location. The AMS can also receive responses to alerts through Amika Situation Commander. The AMS is also able to toggle contact closures, allowing an event back to OnGuard® such as triggering a lockdown. "Amika Mobile has completed required factory testing at Lenel, which validated the functionality of the Amika Mobile Server (AMS) interface with OnGuard®. This allows customers to benefit from AMS alerting to security teams or en masse," said Gidon Lissai, director of strategic alliances, Lenel. "We look forward to their continued involvement in the Lenel OpenAccess Alliance Program." Amika Mobile has unique patented technology that addresses two gaps in managing risk in the enterprise for public safety and security. First, the AMS automatically discovers recipient information from enterprise networks and directories in real-time, leveraging existing networks and best practices to ensure alerts reach all targeted groups and locations, greatly simplifying the administration of alert recipient information. Auto-discovery of mobile devices is especially important for airports, hospital complexes, sports arenas, entertainment venues, and campuses where frequent visitors need to be reached in critical situations. Second, AMS detects filters and manages critical security events triggered from many disparate physical security systems. Such dynamic events can include card access under duress, exceeded radiation thresholds, detected motion from cameras, fire panel events, etc. The AMS platform automatically delivers identified event alerts with relevant text, audio or images to appropriate security groups and triggers a lockdown or strobes as needed in combination with the Amika®Panic Button. "Amika Mobile is the only critical and mass notification solution certified by Lenel with OnGuard® for 5 years now. Amika Mobile has kept up with new OnGuard® features as this is important for Amika Mobile, its teams, and its customers. The universal standardized connector technology for AMS has been implemented to meet customer demand for advanced auto-detection capabilities through Amika Mobile's sophisticated AI-based intelligent transaction engine for disparate events, targeted security team and mass evacuation alerts," said Amika Mobile CEO, Dr. Sue Abu-Hakima. A demonstration of the integration is aimed at ISC West in Las Vegas and ASIS 2015 in Anaheim, CA. Amika Mobile is privately held specializing in critical and emergency mass notification. AMS is ideal for enterprise, community, airport, hospital complex, sports arena, shopping center and campus where visitors may not be pre-registered in a contacts database. The AMS alerts over 20 layers including WiFi, SMS, Email, VoIP, PA systems, Message Boards, Twitter, RSS Feeds, Facebook, etc. The AMS triggers alerts based on disparate sensor events from access control, fire panels, cameras, etc. AMS monitors local weather through CAP and CAP-CP integration, NAADS, NOAA, etc. Emergency and critical alerts are ideal for those concerned with risk in the enterprise as well as public safety and security. Amika Mobile has won 14 awards and sells products through partners, and OEMs to platform vendors and service providers. See www.amikamobile.com or follow Amika Mobile at @AmikaAlert on Twitter or Facebook. Lenel® and OnGuard® are registered trademarks of Lenel Systems International Inc. in the United States and/or other countries. 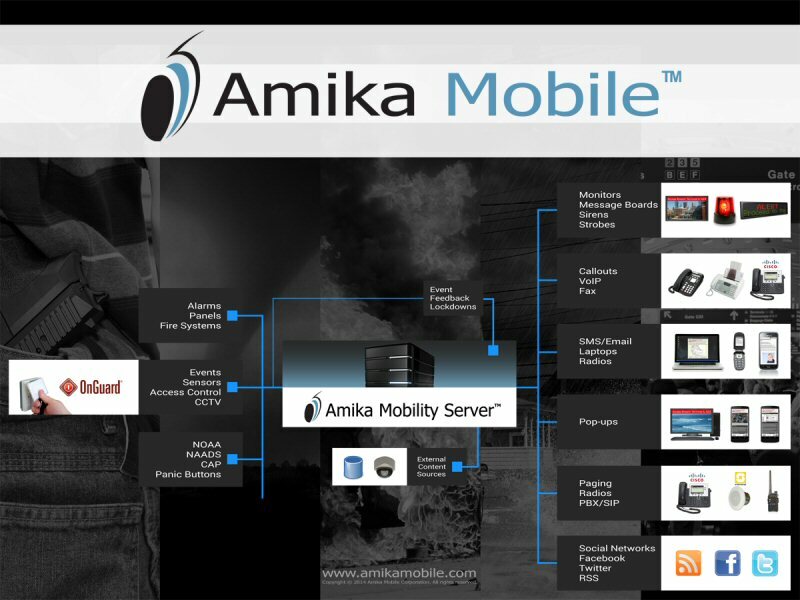 Amika Mobile is privately held specializing in critical and emergency communication and control. Its flagship product, the Amika Mobility Server (AMS), is ideal for enterprise, government, airports, sports arenas, shopping centers and campuses where visitors may not always be pre-registered since AMS can auto-discover mobile devices for emergency alerting. AMS alerts to ANY layers including, SMS, Email, Voice, PA, Message Boards, Twitter, RSS, etc. AMS and Amika(R)Panic can trigger lockdowns and alerts based on disparate events from access control such as Lenel OnGuard, fire panels, cameras, hardwired, desktop or mobile panic buttons. Amika Mobile has won 15 awards and sells products through partners. See www.amikamobile.com.